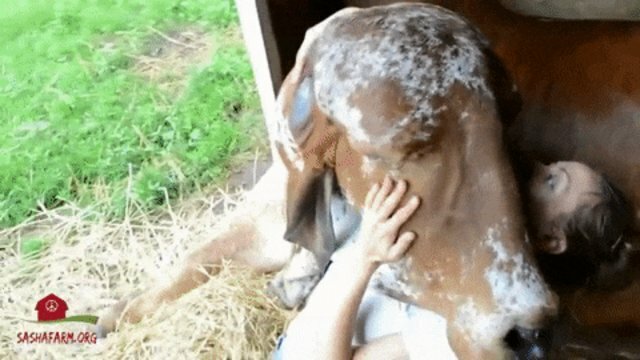 Have you ever met a 1,500 pound dog who loves kisses and cuddles? The answer is probably no, but if you ran into this ox, he might come pretty close. Bhima is not actually your typical pooch, but the way he responds to a good pat down makes you wonder what other dog-like qualities he has hidden underneath his large exterior. 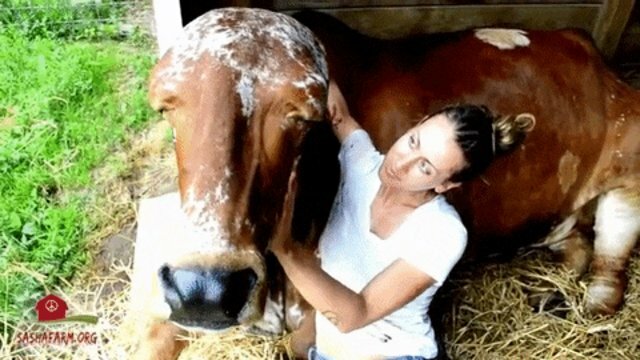 Gary Yourofsky, an animal rights activist, shared a video on YouTube of his recent trip to the Sanctuary And Safe Haven for Animals (SASHA) Farm Sanctuary in Manchester, Massachusetts, where he and another volunteer lavished Bhima with all the attention he loves most. Bhima, an Indian ox, and another bovine, Dharma, first came to the SASHA sanctuary in the summer of 2013. In Yourofsky's video, he perfectly describes Bhima as a "1,500-pound Basset hound." Bhima loves his cuddle time so much, he even gets into purring territory, which officially makes him an ox/dog/cat hybrid. If you want to support farm animals like Bhima at SASHA, get started here.